THANKS TO EVERYONE WHO CAME OUT IN 2010! 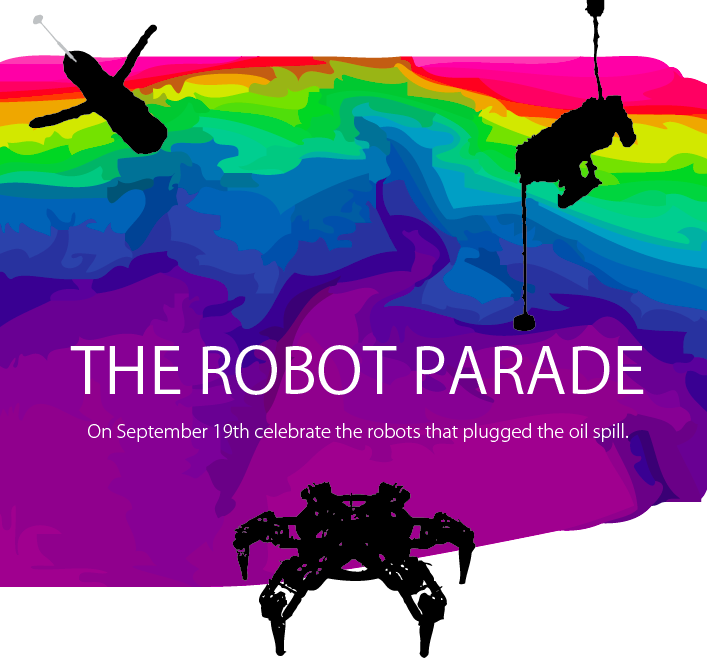 This year's parade is dedicated to our robot comrades at the bottom of the Gulf of Mexico, who have been working their servos off, 13,000 feet below sea level, to save humans and other carbon-based life forms on the planet Earth from the coming ECOPOCALPYSE. Roll with us on our joyous, mechanical circumnavigation of Tompkins Square Park, the first public space in the world designed completely by robots! If you are not a robot yourself, please come anyway, and feel free to bring a robot friend of any size, including palm or nano-sized, or dress up as a robot! Please come join us in the park at the Temperance fountain near the entrance at 9th Street and Avenue A, in Manhattan. Next year we might be calling occupants of interplanetary craft. We are your friends! Tweet, tweet, we're on Twitter. Like, Like, we're on Facebook.